A combination of two topical drugs that have been in use for years triggers a robust immune response against precancerous skin lesions, according to a new study. The research, from Washington University School of Medicine in St. Louis and Harvard Medical School, shows that the therapy activates the immune system’s T cells, which then attack the abnormal skin cells. 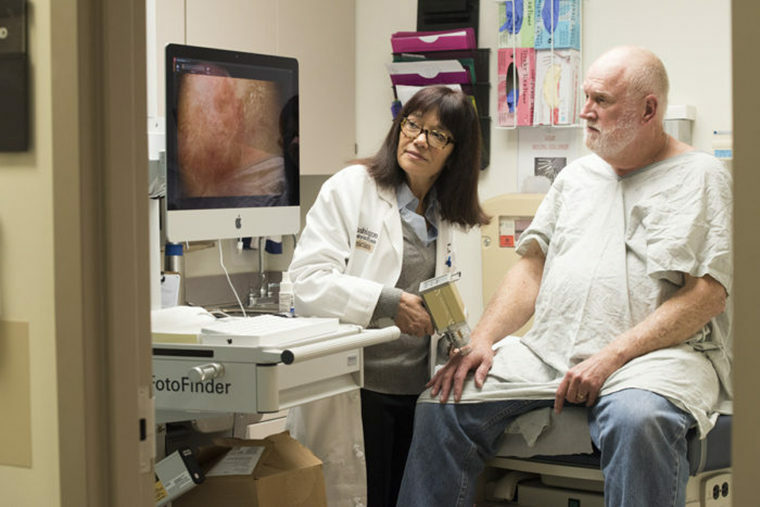 The study, which involved patients with actinic keratosis, a precursor to a type of skin cancer called squamous cell carcinoma, is published Nov. 21 in The Journal of Clinical Investigation. On average, the investigational therapy reduced the number of precancerous skin lesions on the face by almost 88 percent compared with a 26 percent reduction using the standard chemotherapy. While some side effects such as skin scaling and itching were similar with both treatments, patients receiving the investigational therapy reported more redness and increased burning sensations, which are consistent with the immune response it triggers. Interestingly, although not specifically measured, patients who had been treated previously with conventional therapies reported decreased pain and discomfort with the combination treatment, according to Cornelius, who is also the Winfred A. and Emma R. Showman Professor of Dermatology. The investigational treatment combines a cream formulation of a chemotherapy drug called 5-fluorouracil with a synthetic form of vitamin D called calcipotriol. Topical 5-fluorouracil alone is prescribed to treat actinic keratosis. Calcipotriol is approved by the Food and Drug Administration (FDA) for treatment of psoriasis, an autoimmune disorder characterized by red, scaly patches of skin. Past studies of mice prone to allergic inflammation, especially eczema rash on the skin, have shown that they also are resistant to developing skin cancer. These observations suggested that overreactive immunity triggered by damaged skin may have a beneficial side effect — a hyper-vigilant immune system that also attacks any cancerous cells that may form. Earlier work at Washington University by senior author Shadmehr Demehri, MD, PhD, now at Harvard Medical School, showed that a protein called TSLP in the skin activates the immune system’s T cells, which then attack tumor cells. Calcipotriol also was known to cause the skin to produce TSLP. The current study involved 132 patients with actinic keratosis treated at Washington University School of Medicine in St. Louis. Sixty-five of these patients were randomly assigned to receive the investigational drug combination of 5-fluorouracil plus calcipotriol. The remaining 67 served as a control group and received the standard 5-fluorouracil plus Vaseline petroleum jelly. Patients applied the assigned cream twice daily for four days. Patients in the investigational and control groups began the trial with similar numbers of precancerous lesions on each part of the body examined. At each body site evaluated, there were on average about 15 lesions on the face, 22 lesions on the scalp, 14 lesions on the right arm and 12 on the left arm. Following treatment, facial lesions were reduced by 88 percent in the investigational group versus 26 percent in the control group. On the scalp, lesions were reduced by 76 percent in the investigational group compared with about 6 percent for the control group. On the right arm, the reduction was 69 percent for the investigational treatment versus about 10 percent for the control. On the left arm, the precancerous lesions were reduced by 79 percent for the investigational treatment compared with 16 percent for the control. This work was supported by the Washington University Division of Dermatology; the American Skin Association; the Dermatology Foundation; the Burroughs Wellcome Fund; the American Philosophical Society; the La Roche-Posay Research Foundation; and the National Institutes of Health (NIH), grant numbers 1DP5OD021353 and R01GM055479. Cunningham TJ, Tabacchi M, Eliane JP, Tuchayi SM, Manivasagam S, Mirzaalian H, Turkoz A, Kopan R, Schaffer A, Saavedre AP, Wallendorf M, Cornelius LA, Demehri S. Randomized trial of calcipotriol combined with 5-fluorouracil for skin cancer precursor immunotherapy. The Journal of Clinical Investigation. Nov. 21, 2016.